Truly amazing linked 3 bedroom villa with uninterrupted sea views. Air conditioning, WIFI, shared pool, garage parking. Walking distance to beach, shops, restaurants and cafes. Villa Tangerina is a simply stunning 3 bedroom linked villa at the end of the terrace on the small and private Viver a Ria Complex. The villa offers 3 large bedrooms set over 3 floors. 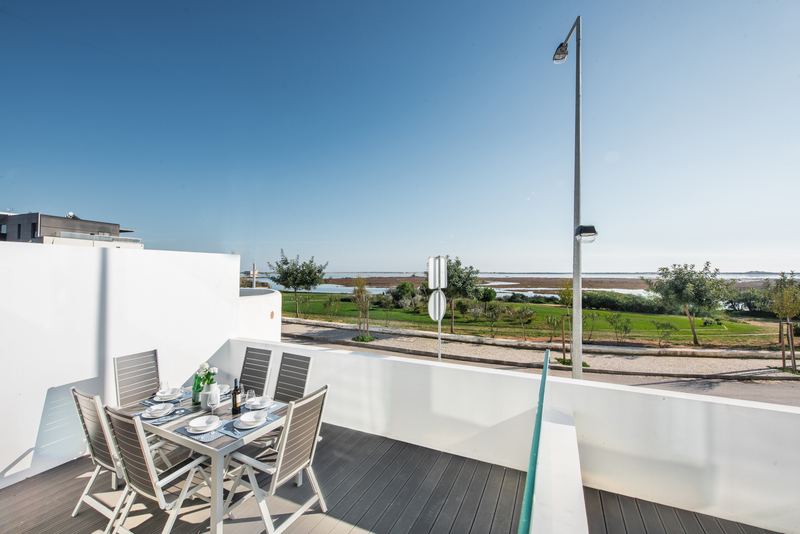 Complete with the most sensational views over the Ria Formosa. Villa Tangerina has 2 entrances. The villa can be accessed via the underground private garage. From the single track and dead end road that turns into a cycle track along the salt flats electric remote controlled vehicle doors open into a communal underground garage. Each villa then has its own private garage with remote control access. The private garage is huge and offers plenty of parking space. At the rear of the garage is a door that leads into the basement of our 3 bedroom villa. The front door to Villa Tangerina can only be accessed once inside the secure gates of the Viver Ria Complex. 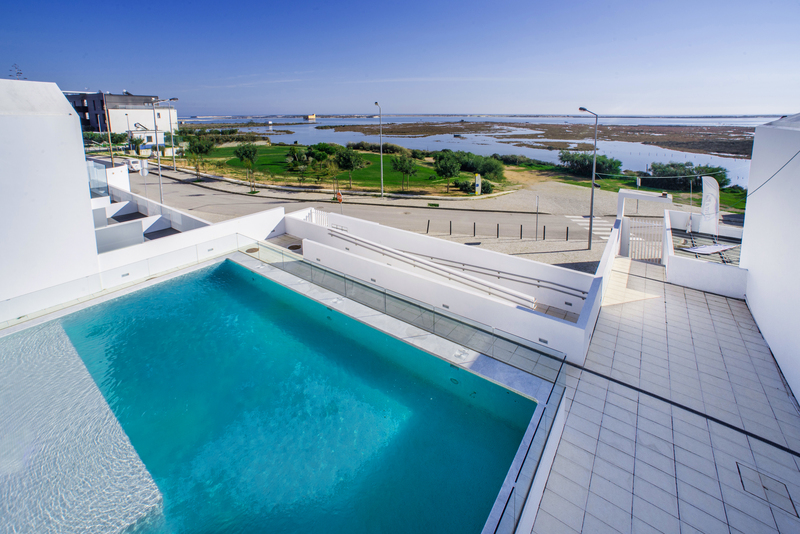 The Viver Ria Complex is completely enclosed and only accessed via the garages or gates to the front of the complex. Each gate has a lock and a code and also an intercom system for each villa. 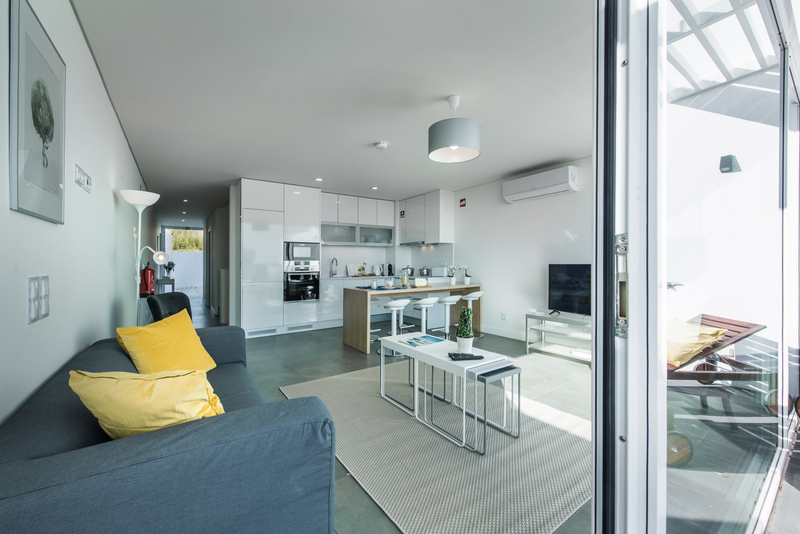 The main doo to Villa Tangerina is actually to the rear of the villa and open into a ground floor hallway that leads to one bedroom and the living space. 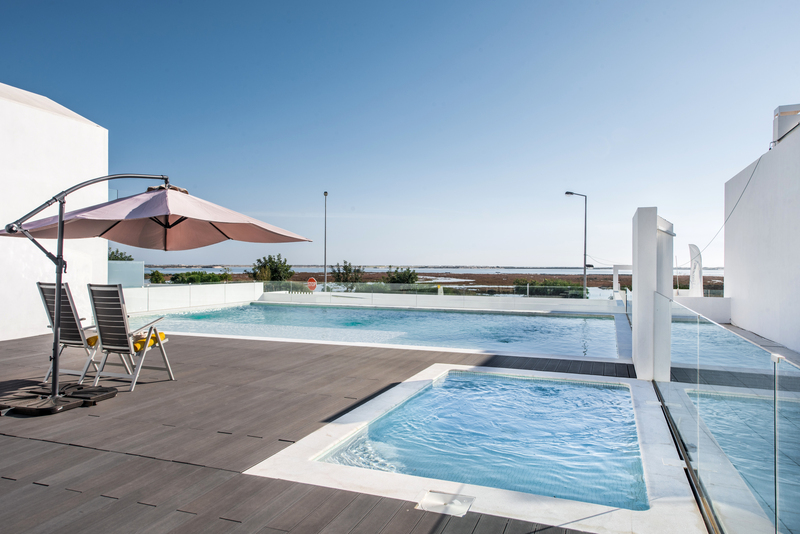 This access is perfect for a quick way to get to the pool that is situated in the centre of Viver a Ria. 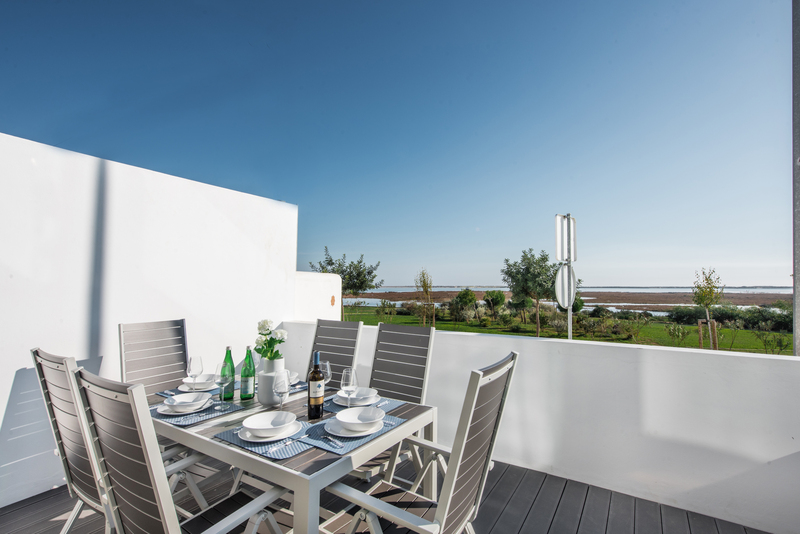 At the ground floor level in our superb 3 bedroom villa with sea views you will find the living space to the front of the villa to take full advantage of the uninterrupted Ria Formosa and sea views. The whole of the front of the 3 bedroom villa is glass to capitalise on the views. But we have added sliding shades to keep some of the summer heat out and also air conditioning to make sure the room still stays nice and cool but you can enjoy the vistas. The living space offers a comfortable sofa along with armchairs you can move to enjoy the view. We have added a smart television and a selection of European channels to try and suit every need of our clients. A set of white and chrome coffee tables sit in the centre of the room and can be placed around the room for your needs. 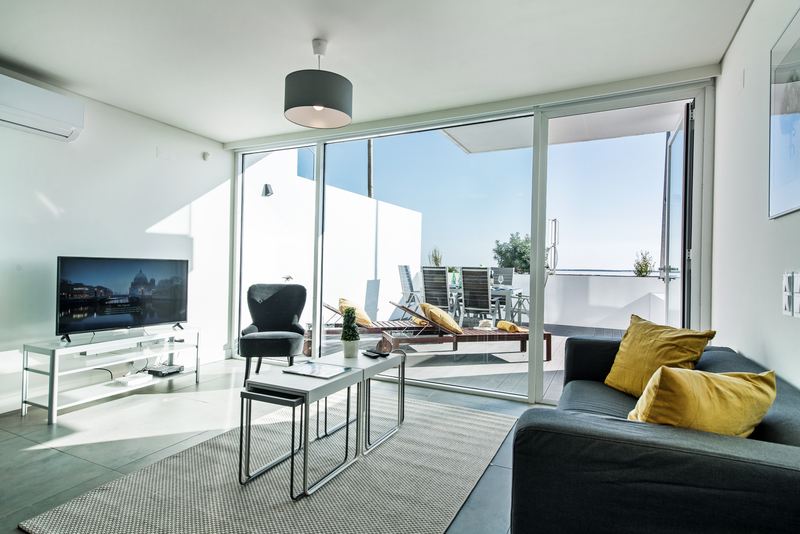 By the sofa a door opens out on to a private terrace with amazing views across the sea. To the rear of the living space is the galley kitchen separated by a nice large breakfast bar with 6 white and chrome stools. 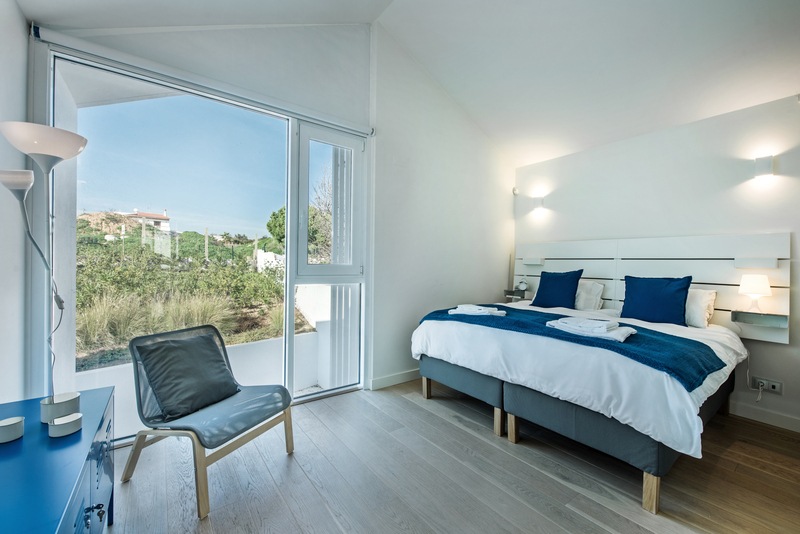 The living space in our fabulous 3 bedroom villa with uninterrupted sea views is exceptionally light and airy and the cool white, chrome and grey themes give the room a thoroughly modern and stylish concept. The galley style kitchen is designed with elegant and modern white kitchen units with easy close drawers and cupboards. In and behind each you will be impressed with the selection of cooking utensils, pots, pans cutlery, crockery and glasses we have provided for your use. We have tried to think of everything to make sure you can cook some amazing holiday meals with the local produce on offer in Fuseta and its daily markets. A good selection of glasses tea and coffee cups can be find along with that all important corkscrew! The kitchen in our 3 bedroom villa has a ceramic electric hob and a full size integrated electric oven. You will find an integrated full size fridge freezer and dishwasher. Along with a microwave, coffee machine, kettle and toaster. The breakfast bar and stools make a great place to enjoy a meal any time of the day. Or maybe just enjoy a glass of wine whilst watching the cook! 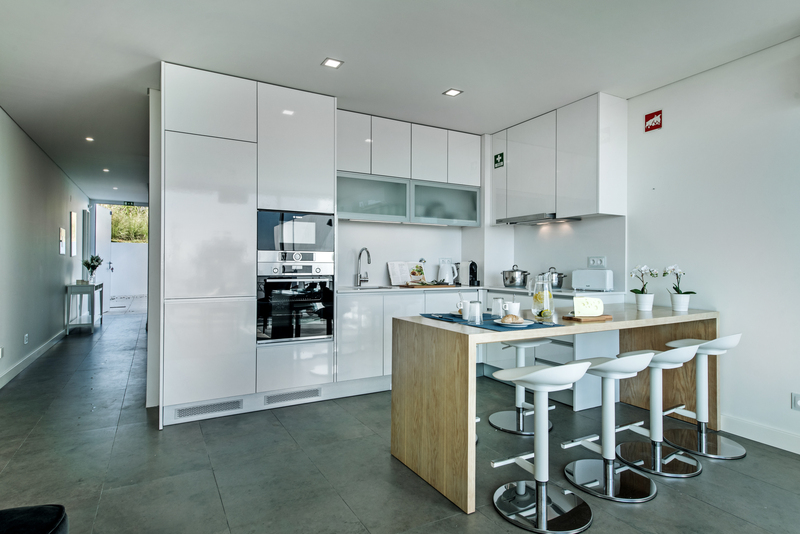 The kitchen and living space work well together and make a wonderful pace to enjoy your holiday home to its full. 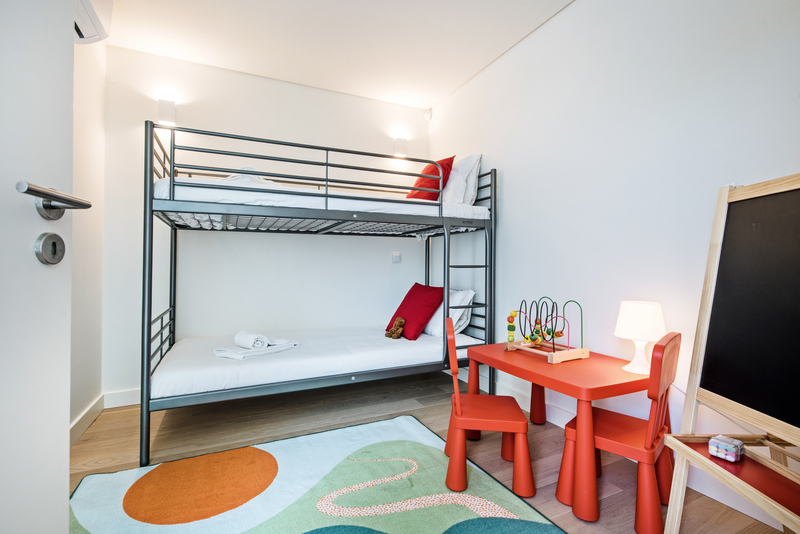 Staying at the ground floor level and by the front door is the smaller children's bedroom that houses modern bunk beds. The bedroom is designed for children in mind and has the added extra of a chalk board and a fabulous little red table and chairs. A large window offers natural light and blinds keep out the light in the mornings and offer a cooling effect. 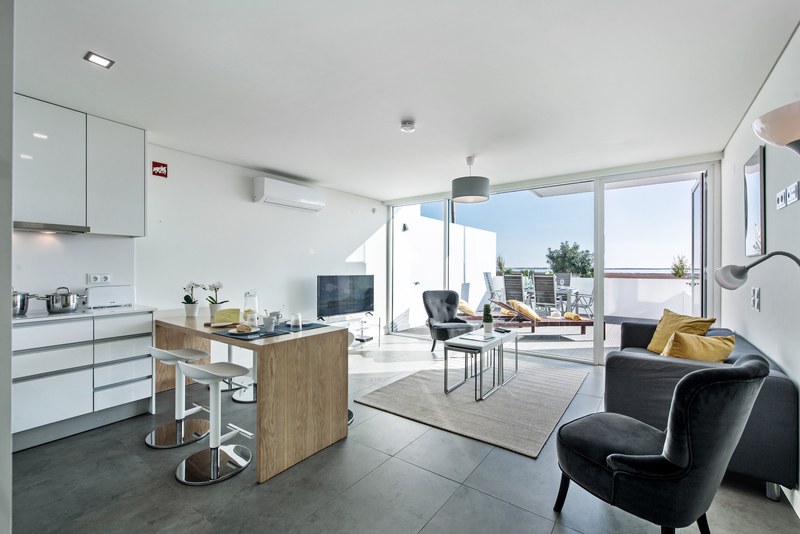 An air conditioning unit helps keep the room cool or warm depending on the time of year you choose to visit our 3 bedroom villa. Towards the centre of the ground floor is a bathroom that is a great option for the occupants of the bunk room and also as a guest bathroom for users of the living space. 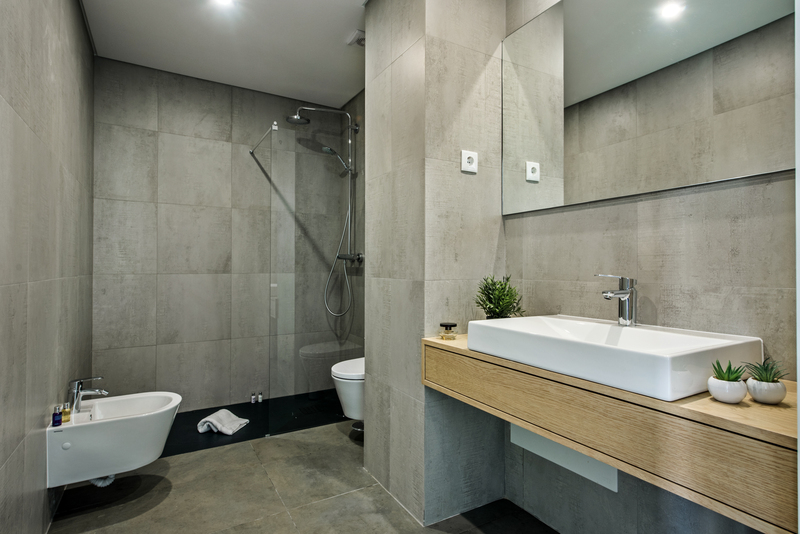 The bathroom is decorated in slate grey tiles giving a modern and clean twist to the room. A walk in huge shower with a rainforest head offers a fabulous bathing experience. 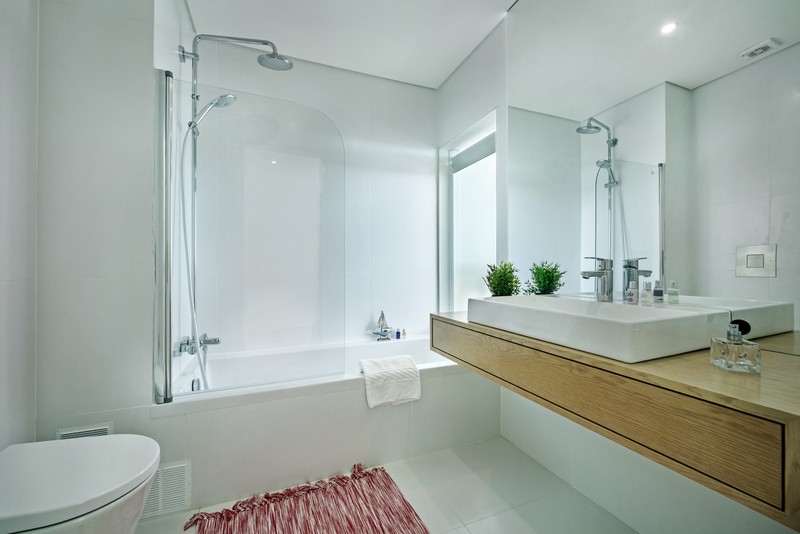 The bathroom is equipped with a bidet and toilet both is clean white ceramics and a large white ceramic basin set into a floating vanity unit. The vanity unit offers plenty of space to store toiletries and cosmetics. Above the basin is a lovely large mirror. You will also find an electric socket and within the unit a hair dryer for your use. Throughout the centre of our 3 bedroom villa with uninterrupted sea views is a staircase to lead to each floor. The first floor offers the master bedroom and a large second bedroom both these bedrooms have en suite facilities. Lets start with the double room thats faces the back of the 3 bedroom villa. 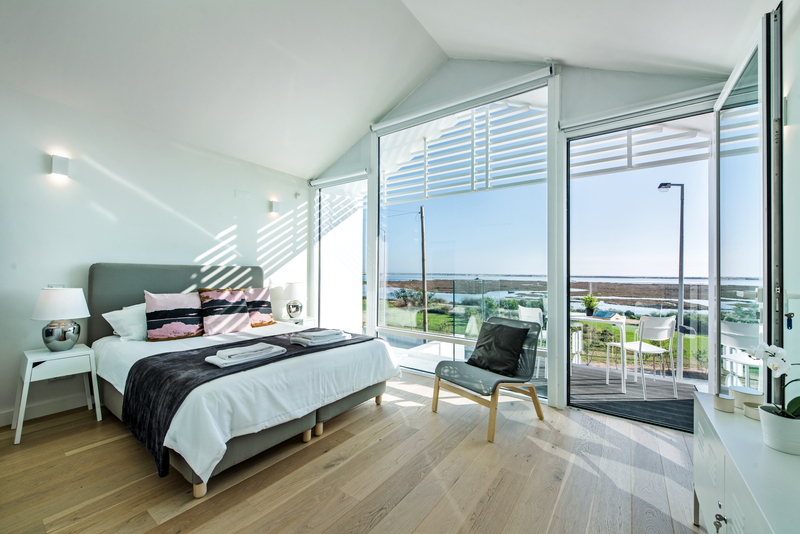 The bed comprises of a super large kingsize bed and and white slated and fitted headboard in keeping with a seaside theme. The headboard has small tables and lights integrated for maximum ease and comfort. We have dressed the bed with an extra large duvet and a pair of pillows for each guest. A large floor to ceiling window looks out onto the terrace to the rear of Villa Tangerina and towards the countryside and mountains. Please do note at the rear of the villa is a single track railway line. It does only run during the day. The windows are double glazed to keep any noise out. They also have sliding blinds for coolness and privacy. Against the wall and opposite the bed is a blue metallic sideboard with a lamp, great for a dresser. The bedroom also has a nice armchair. The walls are adorned with lovely seaside themed pictures. An efficient air conditioning unit offers cool in the summer and warmth in the winter. 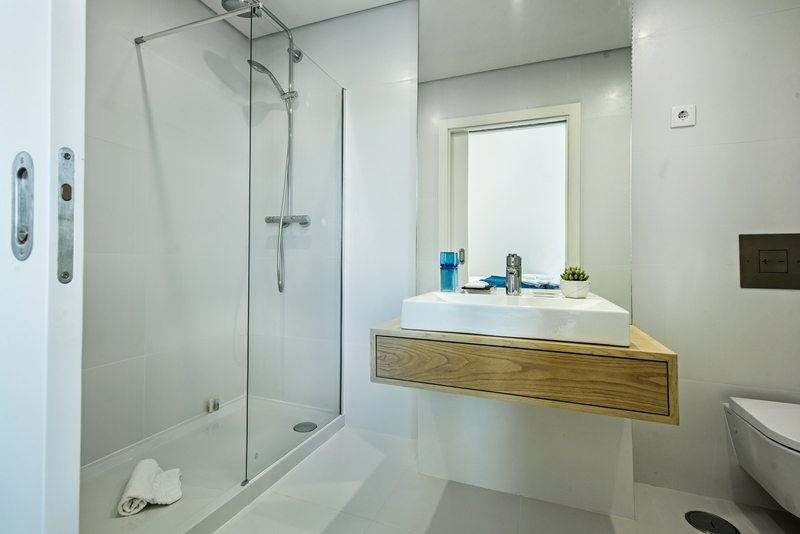 The en suite bathroom offers a huge walk-in shower cubicle with a large rain forest shower and a glass screen. Styled in white throughout the en suite is light, fresh and clean. The toilet is white ceramic and the white ceramic sink is set into a floating light wood vanity unit. This offers a great place for toiletries and cosmetics. A white framed mirror sits above the vanity unit and you will find an hairdryer for your use. The master bedroom takes full advantage of the views in this 3 bedroom villa with uninterrupted sea views. The super king size bed takes full advantage of the views from the floor to ceiling windows. Both above each side of the bed and on bedside tables are lamps to add light and ambience to the room. A white metallic dresser offers storage and the chair allows you to sit and enjoy the ver changing scenery from behind the glass at the highest point of the villa. 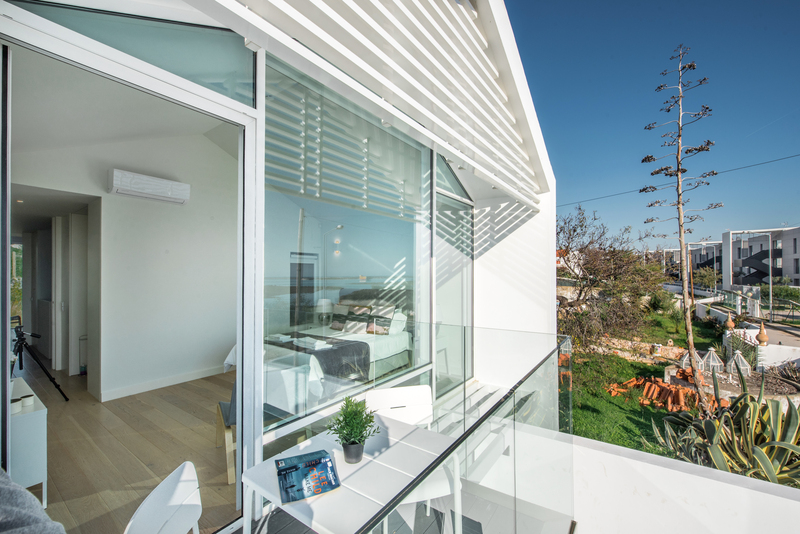 A door leads from the master bedroom to a small glass fronted balcony to enjoy the panoramas. Another door towards the rear of the bedroom gives access to the en suite bathroom. This en suite has the added luxury of a full size bath and over head shower. A window form the master bedroom add some all important natural light. The toilet, bidet and basin are of a sleek modern design in white ceramic giving the bathroom a very fresh and clean feel. The basin is set in to a light wood floating vanity dresser, a great hidden space for toiletries and cosmetics, her you will also find a hairdryer for your use. There is a electric socket above the vanity unit along with a massive mirror. 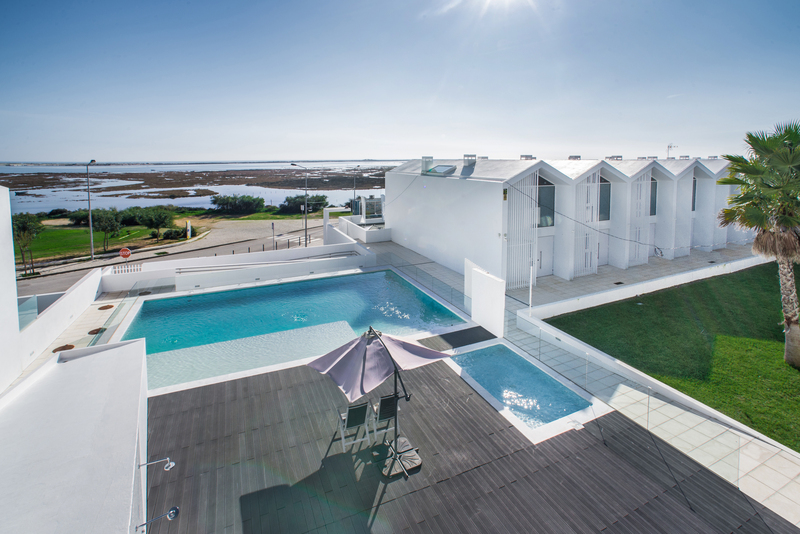 Villa Tangerina, our 3 bedroom villa wit uninterrupted sea views has been designed and built solely to encompass the best views the East Algarve has to offer on the protected Ria Formosa Country Park. 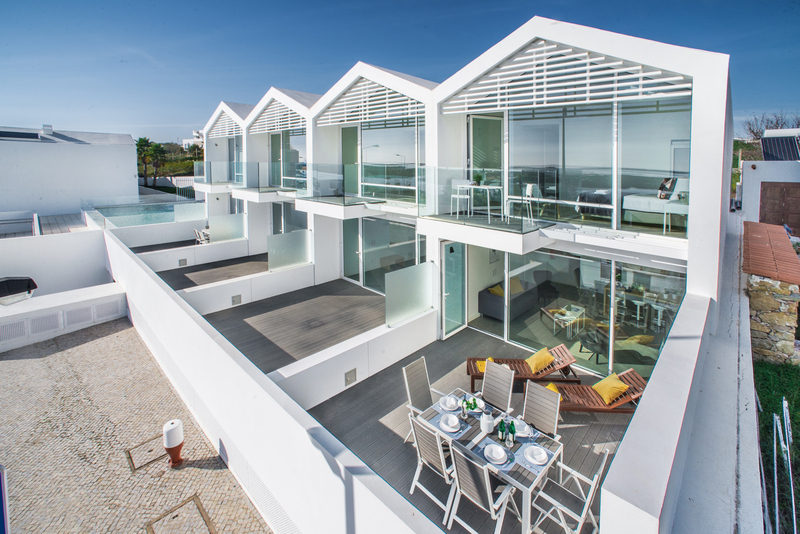 So both levels of the villas offer a terrace to make sure the views are fully taken advantage of. private terrace. We have placed an outside dining table and chairs along with a couple of sun loungers for you to enjoy. The decking is made of a durable plastic but gives the feel os sea side decking. A small smoked screen offers some privacy from the next door villa and Villa Tangerina is slightly raised from the road below so again privacy is well thought out here. 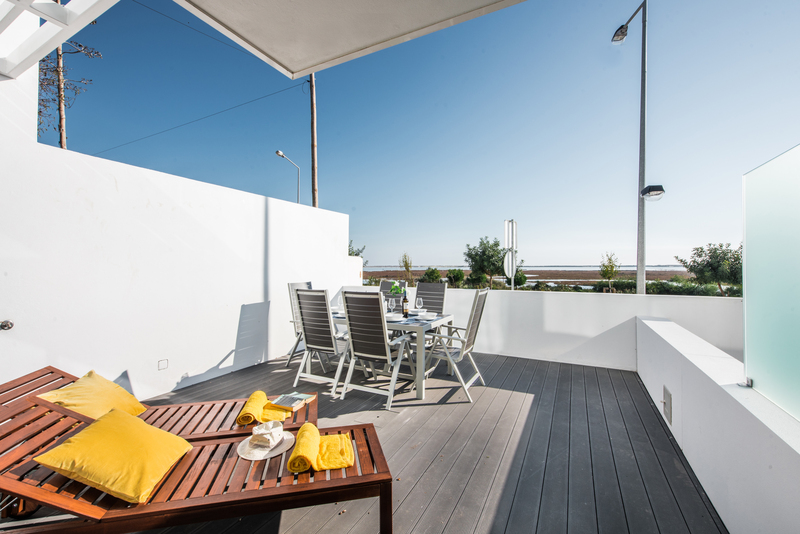 This terrace takes advantage of all day sun and will provide an excellent vantage point for some stunning sunsets. The other terrace is accessed form the master bedroom and offers a quit place to sit and reflect. We have places a small white tables and chairs on this terrace to make sure you get maximum enjoyment from the space. 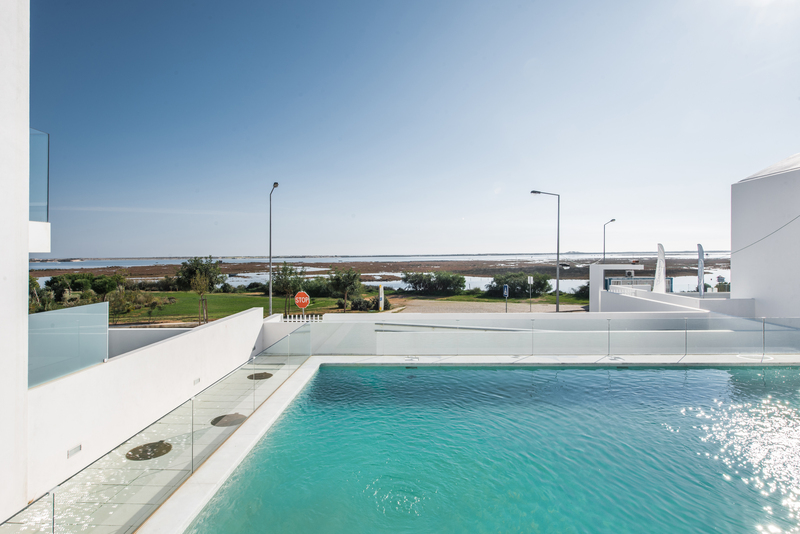 A glass balustrade conforms to safety but makes sure no view is lost. A greta place to enjoy watching the many walkers and cyclists go by enjoying the local Ecovia coast path. 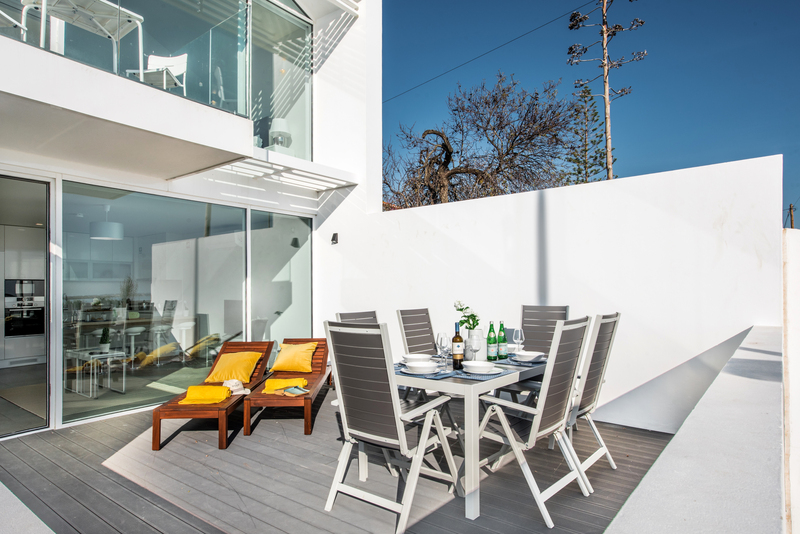 At the rear of the 3 bedroom villa there is a terrace area that can be enjoyed more so as Villa Tangerina is end of terrace. This area is very much the best way to access the shared pool complex. 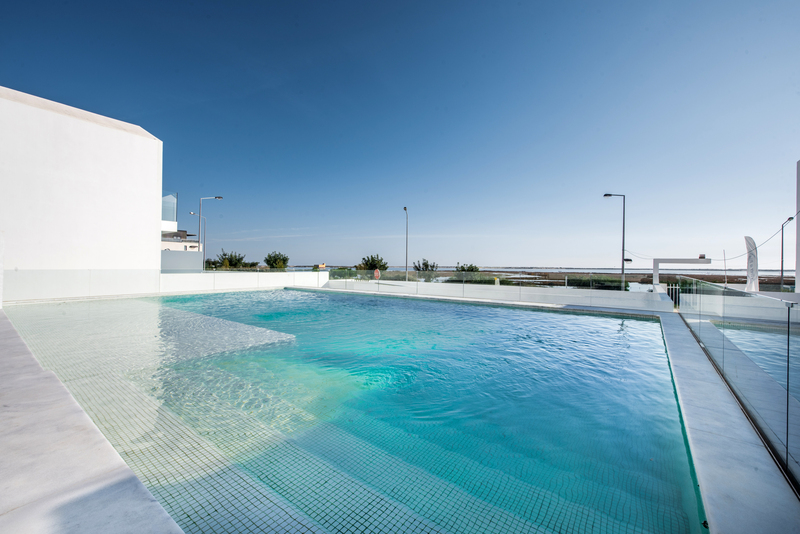 Villa Tangerina our 3 bedroom villa with sea views in nestled within a new complex finished in 2017 called Viver a Ria. 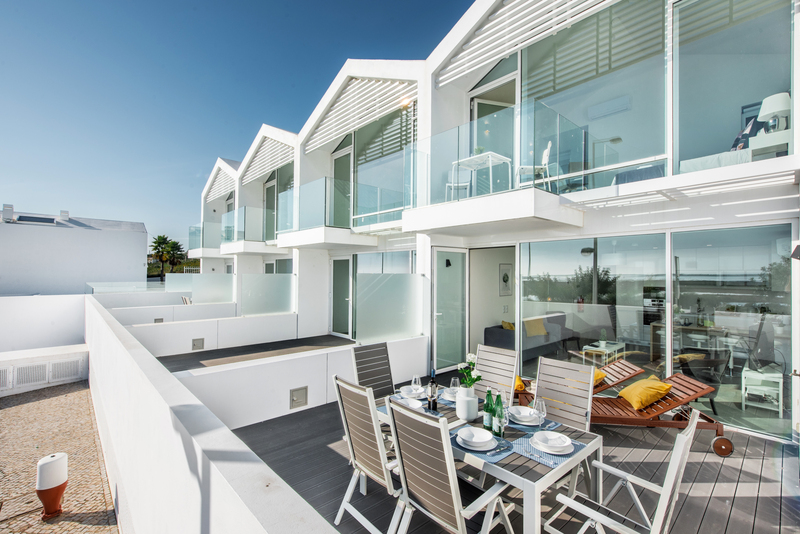 The complex consists of just 12 linked villas all f the same beach hut style design all built to take advantage of the beautiful Ria Formosa marshes and sea. Viver a Ria is a gated complex so access to the pool and gardens is for the occupants of the villas only making it a nice quiet and tranquil resort. The villas are divided as a row of 8 villas then a central pool complex followed by a row of 4 villas. The pool area is decked in a beach style decking and offers plenty of space to sit and enjoy the sunshine. The pool is an excellent size and offers varying depth levels. The steps are of a roman style so the pool is outstandingly easy to get in and out. A very shallow area has been designed for those who would just like to lay in the cool water without having to swim and it all looks out out to the sea. The resort also offers a nice little pool for younger children to the side of the main pool. So a great little area that is safer for the younger ones on holiday too. At the back of the decking is a small wash area and also a bathroom facility. 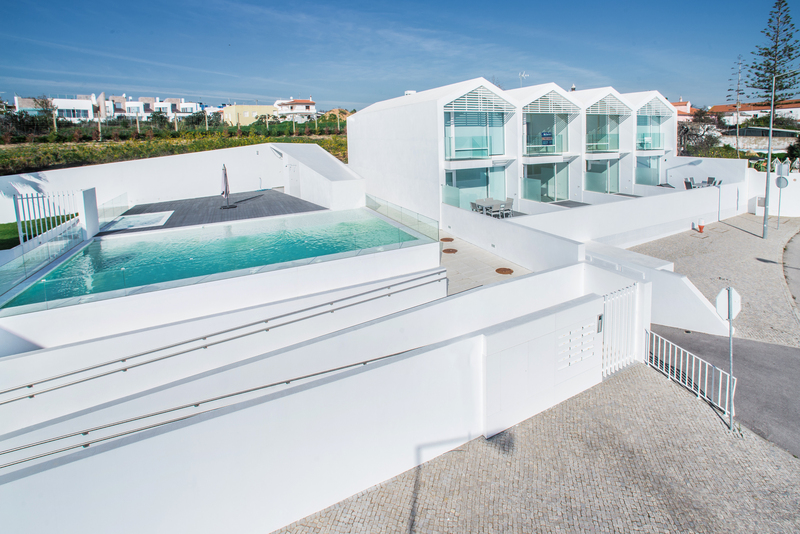 The Viver Ria Resort has some small well kept lawned areas offering some diversity to the white washed walls and glass balustrades. Exceptionally well deigned to a very high standard the complex is modern, impeccable and elegant. 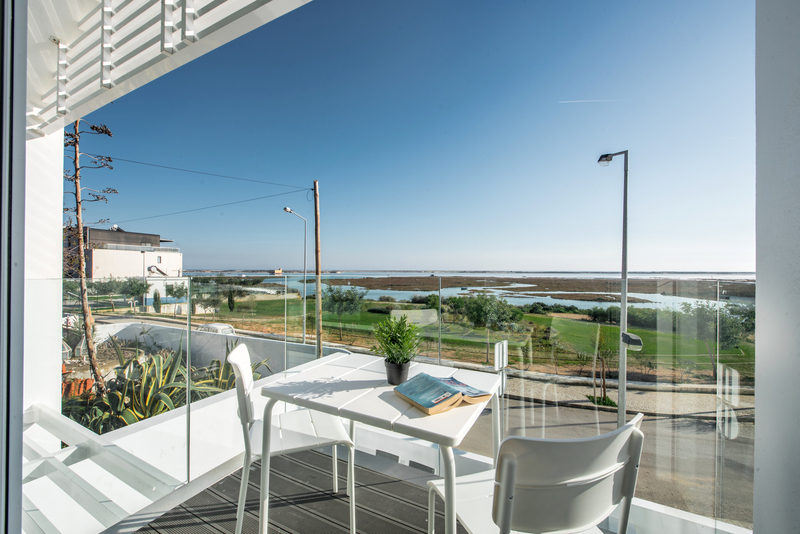 Overlooking the Ecovia Cycle path, marshes and salt flats you will find its is a wonderfully quiet and tranquil location to enjoy your holidays in Fuseta. Villa Tangerina has its own garage with remote control access from within a communal garage area. This areas is well kept, clean and a great way to access the villa safely. This 3 bedroom villa has the added extra of a utility/children's play area. 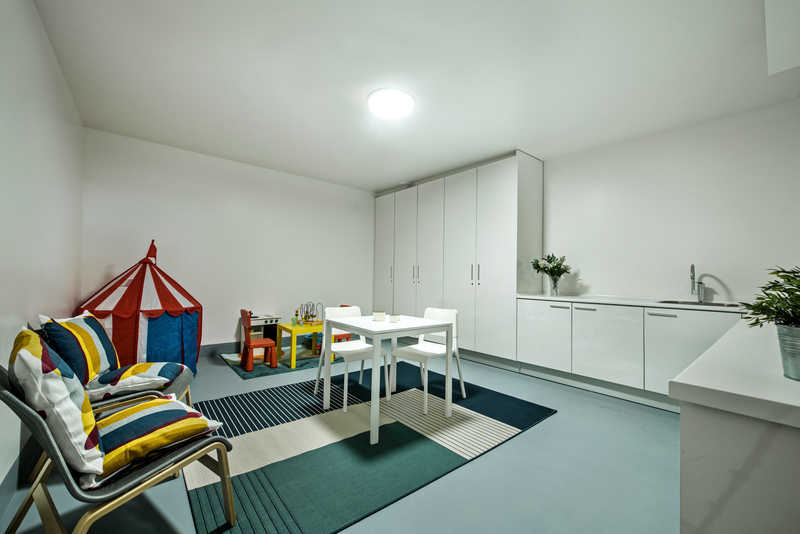 At lower ground level and next to the garage this room offers a selection of cupboards and wash facilities along with lots of storage. This room houses the integral vacuum cleaner along with a washer dryer. We have added a children play tent and table and chairs and an area for family to sit an play or interact with the children. It is a super convenient addition to the 3 bedroom villa. Villa Tangerina is a beautifully furnished 3 bedroom linked villa with simply amazing views just on the edge of the old and popular fishing Village of Fuseta. The 3 bedroom villa offers flexible accommodation to suit couples or a family and every details has been thought of to make sure you have a wonderful holiday experience with the villa. 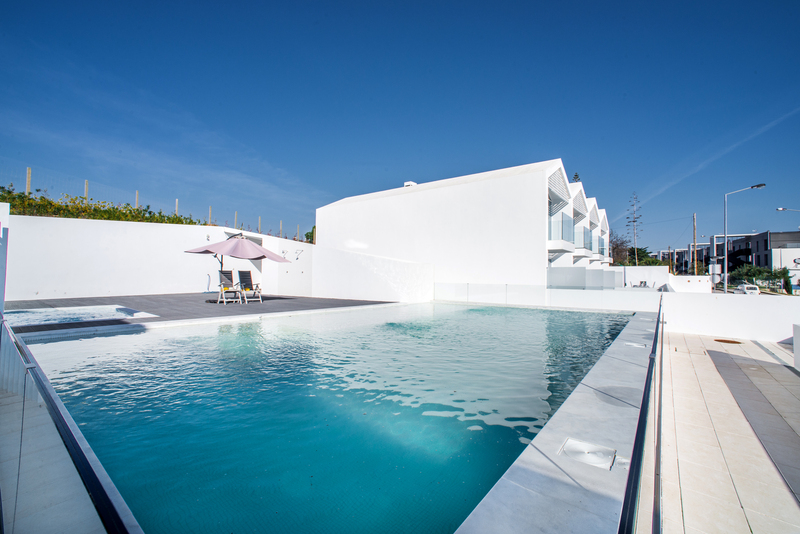 Villa Tangerina is located on the Viver a Ria Resort and is less than a fat 5 minute walk to the centre of Fuseta where you will find 2 supermarkets and an abundance of cafes, bars and restaurants. All the normal facilities are available including a banks, chemist and post office. You will find great companies offering windsurfing, paddle boarding and other water sports along with boat trips to see the island of even maybe dolphins. 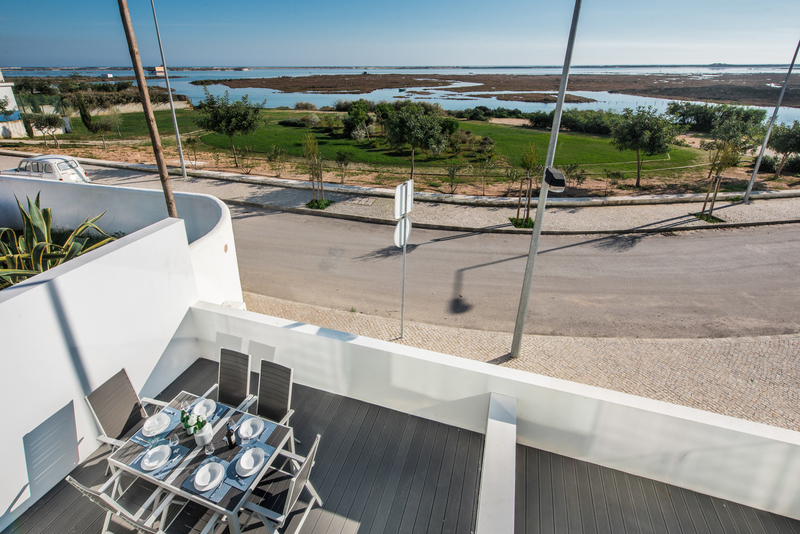 Fuseta is located on the ria Formosa a protected area due to the abundance of wildlife so is great for eco tours and learning about the fascinating environment you have chosen for your holiday. In the summer there is lots of street entertainment and live music. In the winter it is much quieter but also a fabulous time to enjoy cycling, walking and birdwatching. Maybe even a spot of golf. 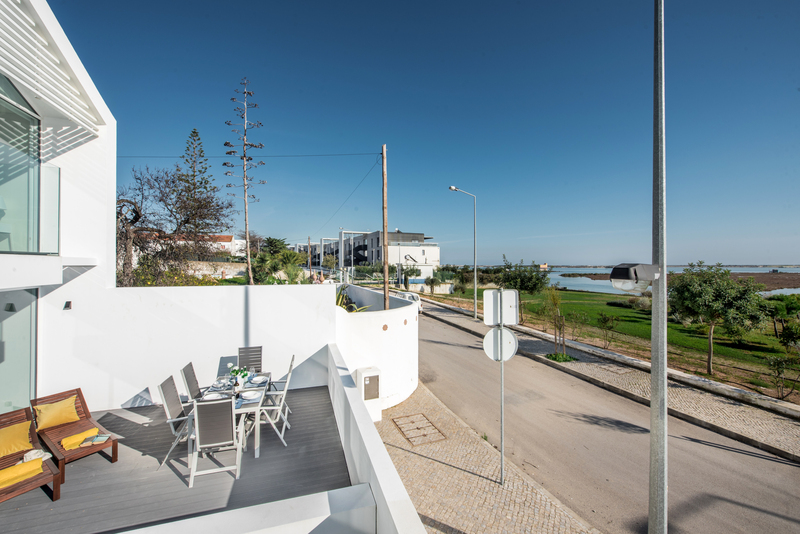 The trains station is also less than a 5 minute walk so there is no need to hire a car and also this gives you access to all the other wonderful places to visit in the Algarve. 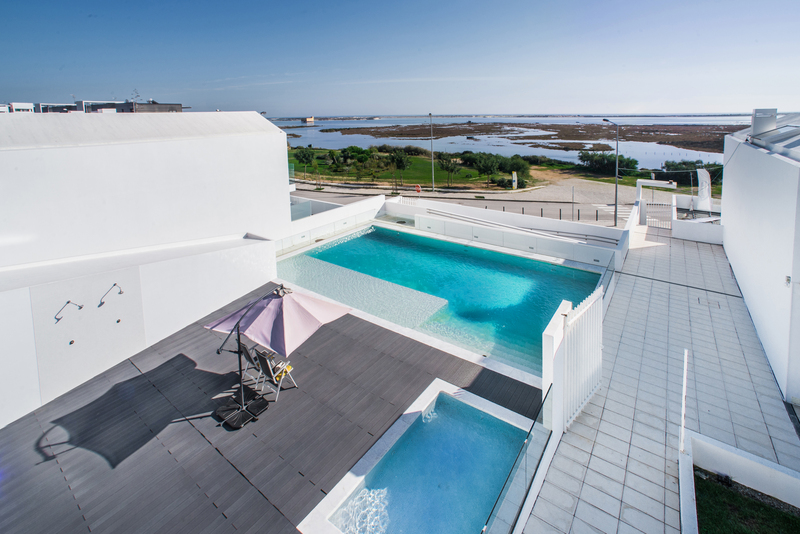 Maybe Villa Tangerina can make for a great 2 centre holiday maybe mixing the hustle and bustle f the capital city of Lisbon with a nice relaxing few days to recover and start your travels again. We have thought of every comfort for your stay but also provided an unusual and fantastic property to enjoy. Our lovely 3 bedroom Villa comes with its own manual that you can download to your tablet or smart phone. Packed full of information to make the best of your holiday starting from the moment you arrive. It tells you how to collect the keys, who will look after you during your stay and clear concise directions to Villa Tangerina. Then it is packed full with details of the best restaurants, taxis and local amenities and activities.